Today begins the fourth month of my “commitment” calendar (thirty days more or less), during which I commit to doing something each day. This month, lucky world!, it’s a blog post each day! I was first intrigued about making a monthly commitment when I heard Matt Cutts on the Ted Radio hour. This sounded doable. Safe. Fruitful. 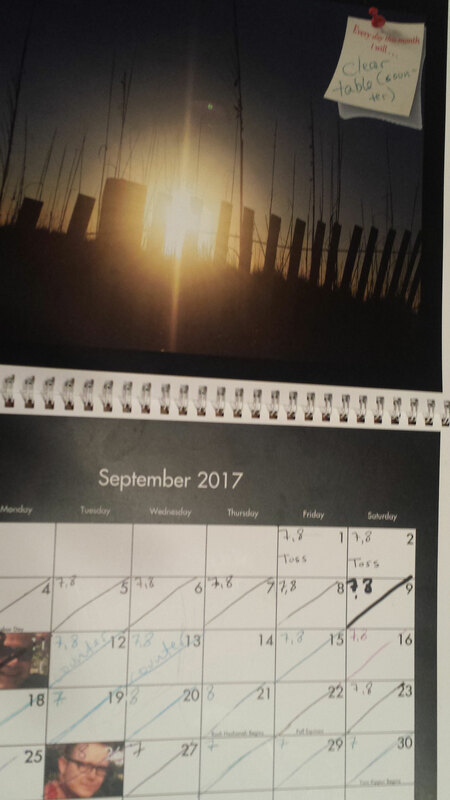 For my birthday, I created a calendar with beach photos I took during a women’s retreat. That first month, I committed to moving for at least five minutes a day. Yup. Working from home requires unspeakable things. I would go, not only days, but weeks!! with minimal movement. Chained to my computer getting the job done. I was only able to cross out 19 of the 31 days of July, but hey! That was better than any of the previous 6 months! I walked, gardened, mowed, and . . . other things? I can’t figure out what some letters I jotted on my calendar mean (CJ? Jacks? P? ), but they all mean I moved at least five minutes. Most often 30 plus minutes. In August I committed to a cup of green tea every day. After the stress of moving for at least five whole minutes daily, I deserved to relax and have tea. 29 out of the 31 days of August! On 12 of those days I continued to move at least five minutes (mowing and walking). For September, I set the bar higher: clear the kitchen table. Working from home also requires special talents. One of those is the ability to turn a blind eye to housework. After twenty plus years as a freelancer, I’m an expert, so even clearing the table was a special challenge. What’s heartening to me is that the challenges from the previous two months kept chiming in. Not 100%, but often enough to know that the challenges had made a difference. I moved at least 5 minutes (often over 30 minutes) for 23 days, and drank green tea 21 of those days. The calendar challenge doesn’t and will not perfect me. But it makes me a more mindful and balanced person. This month the commitment is to a blog post a day. This feels less “doable” and less “safe,” but here I go! I promise these won’t be introspective posts about how I manage to write a blog post. I have much more to explore: feeling choked, living in echo chambers, murderers, stories, friends, and a smidgin of politics. So let’s dive into October. I won’t be perfect. It’s after midnight and I’m already late dammit. But I’ll be more balanced. More mindful. That’s a great idea! I definitely need to move more, but luckily my husband gave up expecting me to do it years ago and takes it upon himself to do most of the housework! Ha! I wouldn’t change that! Maybe you can dance while he dusts? Thanks for visiting. Thanks, Tandy. I’m a bit terrified. But willing to try! Good for you! Keep up the good work!! !